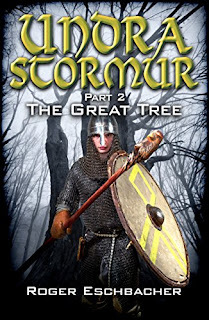 The big day has arrived for the second part in my YA Viking fantasy series, Undrastormur, Part 2: The Great Tree! Here's the description: "When the roots of the Great Tree are attacked by a plague of monster slugs, Eirik and his companions must destroy the ravenous creatures before they release the Nidhoggr, a mountain-sized dragon bent on bringing death and destruction to all of the nine worlds." Sound exciting? I think so and hope you'll agree. This novella-length fantasy adventure is now available as a Kindle title on Amazon.